We partnered with UGG to celebrate the culture and fashion forward lifestyle behind their brand. ComplexCon in Long Beach, CA was our stage. This annual gathering brings thousands of attendees from Southern California and beyond to explore, interact, purchase and learn from the brands, personalities and cultural influences that drive fashion and entertainment forward. 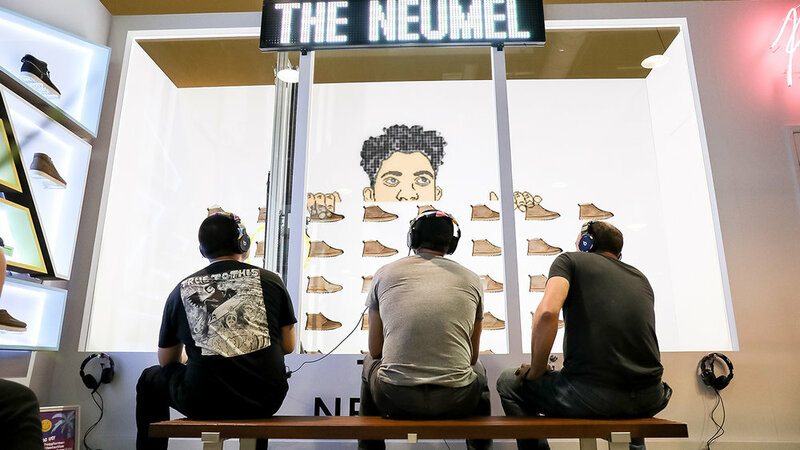 Leveraging a fun, bright, and colorful palette the UGG space was designed as a creative hub to showcase the Neumel shoe, UGG partnership with hip-hop act Super Duper Kyle, and act as an interactive retail storefront. The UGG Neumel embodies the understated yet luxurious culture of the hip-hop community. Showcasing this product in creative ways was a key goal for the overall space. An interactive robotic mural painted directly onto Chestnut Neumels throughout the weekend and the brightly lit product displays allowed UGG a chance to show off unique variations of the line in a hands on format for consumers. Kyle was the perfect ambassador to align with UGG for ComplexCon as his California roots fit seamlessly with UGG’s California heritage campaign. Kyle’s music and charismatic personality came to life throughout the space with bold colors and tasteful touches in between. Kyle dropped by the booth Sunday afternoon and brought with him a youthful crowd, allowing fresh faces to discover UGG in a whole new way.